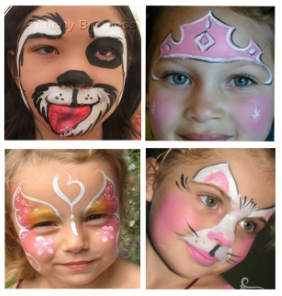 Choose a Clown or Fun-Dressed Entertainer for face painting at parties or events in Kitchener, Waterloo, Cambridge and Guelph. Only high-quality face paint. The kids must have at least one adult present while the face painting is happening. A table and two chairs are required for the face painting. This table should be cleared of food, drink, etc. in preparation for the face painting. Pleas provide notice if these items cannot be provided for the face painting. A shelter is required for the face painting, in cases of extreme sun or any rain. Face painting will not done for any child who does not want to be painted. If there is a long line for face painting, the line will be stopped 15 minutes before the end of the scheduled time for face painting.